A while back I got a spiralizer . For some reason, I hadn’t used it yet. Until now. I made this zucchini pasta. I’m so glad I did. The spiralizer is super easy to use and it’s priced very well. It makes great low carb noodles. 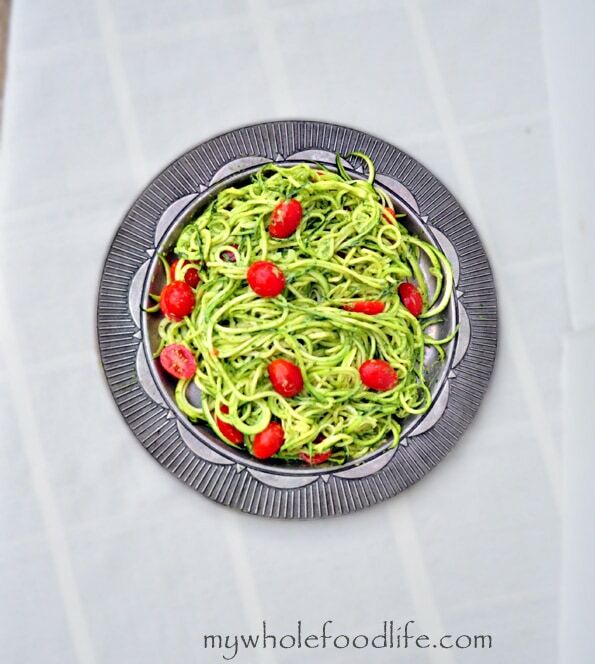 This zucchini pasta with avocado pesto is delicious and low carb! To get the Paderno Spiralizer, click here. This whole meal literally took me 10 minutes to make! Great for those busy days when you have little time to cook dinner. Perfect for those hot days in the summer where you don’t want to be slaving over a hot stove. You could top this with your favorite protein to make it complete. Another quick meal on my blog is my Pesto Portobellos. You can learn how to use the spiralizer by watching this short video. Using a spiralizer , cut your zucchini into ribbons and set aside. In a food processor , combine all the ingredients for the pesto and blend well. Take about 1/2 cup of the pesto and toss with the tomatoes and noodles. Save the remaining pesto for another time or use it as a sandwich spread. If you have a spiralizer, I highly recommend this book . It has amazing recipes for the spiralizer that go well beyond the zucchini noodles. I got about 2-3 servings out of this. Enjoy! What can I substitute for nutritional yeast or can I omit it all together? We aren't vegan, can I use loccatelli or parm? Can I omit or sub nutritional yeast? ?